Let’s set something straight. I missed the Ateneo-NU “do-or-die” game. I was checked in the Pal airport terminal awaiting my flight to Bacolod. The television monitors at the gates were showing something else while the sole TV in the lounge was out of order. Good thing my friends were updating me thru Viber and some kind lady was updating those who couldn’t watch in Atenista Ako FB page. Instead of getting quarter by quarter scores, I was receiving play-by-play analyses. No one seems to be in the mood to work! What’s more, they were worried about the dark, heavy, gloomy clouds outside was troubling. It was signaling a heavy downpour! My flight was delayed but what’s new with PAL? At least I can finish the game while still on the ground in Manila. First, second and third quarters pass. Ateneo was down but caught up. Come fourth quarter, it was time to board. As I walk towards the gate, I continued to get updates. As I show my boarding pass and walk thru the tunnel, it was a nip-and-tuck game. I took my seat and the doors closed and it was a deadlocked game! Still I kept my phone on but in silent mode to get the updates. As we began to taxi down the runway, the game clock was at 9.3 seconds with the NU ahead by 2 points. 9.3 seconds! You could hold your breath in 9.3 seconds! And then the game was delayed due to lighting malfunction. Bitin! WTF?! Throughout the flight I was thinking of positive scenarios although I knew that the situation was precarious. Maybe Ateneo scored 2 points to send game into overtime? Or even better, score 3 points for the win?! Darn, bitin naman! Just before touchdown, phone started to vibrate as the updates and comments poured in. Talo! Bad trip!!! Since I was totally oblivious to what happened after the delay, I wanted to watch the replay. Man, it took me over one hour to find out what happened after the last 9.3 seconds of play! I was hoping for a more favorable result but nevertheless , I am proud of our Ateneo team and congratulate NU! And my thoughts of the DLSU – FEU game? That’s a topic for tomorrow! Nope, I’m not talking about the Filipino peacekeepers who fought Al Queda operatives who surrounded them for three days and escaped under cover of darkness. That is truly heroic and commendable. 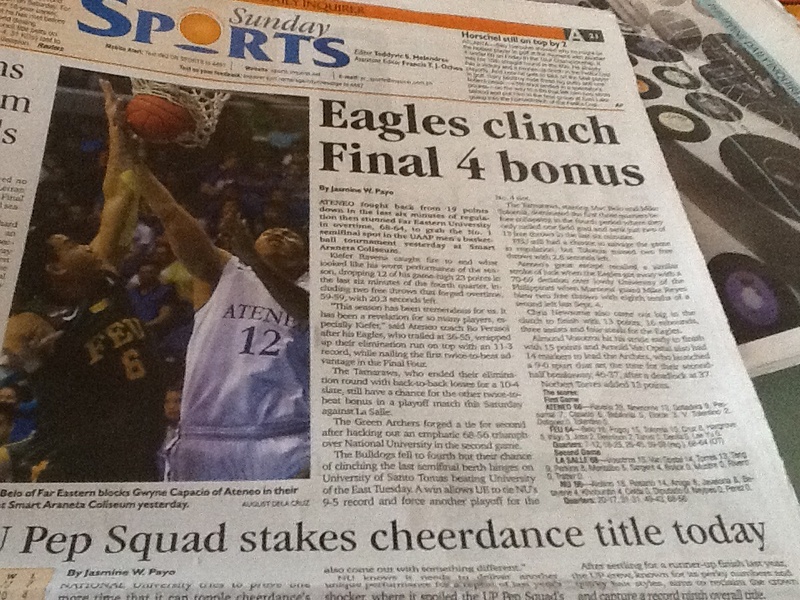 What I’m talking about is the unbelievable recovery of the Ateneo Blue Eagles to beat the FEU Tamaraws in overtime. The whole UAAP basketball community is stunned by what transpired. I wasn’t there to watch live but I can imagine what the crowd was thinking at that very moment. 19 points down with 6 minutes to go…talo na yan! 10 points down with 3 minutes to go…doubtful, I don’t think we have enough time. 6 points with 1 minute to go…Puede pa, maybe just maybe. Tied game with less than 2 seconds to go but with FEU premier guard on the FT line..déjà vu ala UP? And then Tolomia missed both free throws. Unbelievable! In overtime, it’s who gets to strike first and who can hold the fort in the end. Whew! Ateneo didn’t just dodge a bullet, we dodged a missile! In this game, could we say that Ateneo wanted it more? FEU must’ve also wanted it because number 1 seed was on the line and with it the crucial twice-to-beat advantage. And for the first 34 minutes, FEU appeared that they indeed wanted it more and they made the Ateneo team look like high school players. But what happened after that was truly miraculous. Ateneo started to make its shots. FEU started to miss theirs which resulted in Ateneo exploiting their running game. Why FEU didn’t slow the game down is a mystery. Did FEU panic? They have been in close game situations before! This miraculous victory was the result of two things: skill and luck. Had Ateneo not made its shots in the last 6 minutes, we would probably lost by a lot. But Lady Luck was smiling at us. Had FEU made one or two more free throws in the last quarter, the momentum could have changed and Ateneo would have fallen short. Putting the game away is one of the hardest things to do and with half of the coliseum jeering the shooter. I wouldn’t want to wish this on anyone. 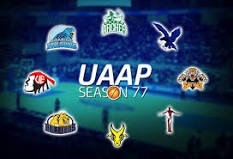 I’m a die-hard Atenean and I believe in the 6th Man. Of course I’m biased. For the other schools, they believe their cheering is better than ours. Fine. But in our case, we have the history and mystique coming back from seemingly hopeless situations. And with half of the spectators shouting “Get that ball!” at the top of their voice during a frenzied rally, that could be truly rattling. The other side wouldn’t know what we are saying when we chant “Fablioh” or “Halikanu”, but it’s no joke going up against rabid fans. For this UAAP Season 77, Ateneo has had numerous slow starts and at least 3 come-from-behind mind-boggling finishes. Is it too much to ask for a faster start and a sustained finish? Oh well, until that happens – “Mary For You, For You’re White and Blue. We Pray you Keep Us Mary Constantly True. We Pray You Keep Us Mary Faithful To You! ” OBF! Remember the last game? What?! You don’t?! Here’s a video to jar your memory . . .
Now in the 2nd round, the situation is different. Ateneo is fighting to win its last 4 games for positioning in the UAAP Final Four; UST, on the other hand, has to win it’s remaining games just to have a remote chance of making the Final Four. Ateneo has its lineup intact; UST does not have Kevin Ferrer. So who do I think will win on Saturday? Ateneo definitely has the advantage and should win by about 7 points or so. I’m not being overconfident. In fact, I’m being cautious. I daresay I’d wager a blowout but I don’t know which Aljon Mariano will play on Saturday. Will I see the dismal Aljon or a fantastic Aljon? If the latter, then UST has a chance. It’s a given that Paula . . . este, Karim . . . Abdul will have his usual game and try to carry the team. I wonder if his recent whining regarding his teammates will help him or alienate him from them. Subido and Vigil will have to play excellent games to give the team a chance since UST isn’t that deep. Ferrer’s injury is definitely a big blow to them. Kiefer has to have his usual game and the Ateneo bigs have to contain the damage of Abdul. With no Ferrer, maybe Tolentino can get his outside game back. Does UST have a Kiefer-stopper? Daquiaog? Aljon Mariano? If UST focuses on Kiefer, then Von Pessumal should step up and make his shots. Chris Newsome should also have a good game. I wonder if Gotladera can hold his own versus Abdul. Gotladera has been a revelation and is the new darling of Ateneo basketball. I believe UST is a longshot to make it to the Final Four even if they win all their games. Kevin Ferrer may be gone for the season and their placing is even lower than UE. At best at this point they serve as spoilers, but spoilers can be dangerous because they have nothing to lose and everything to gain. So Ateneo should just play it’s game and not take UST for granted. I hope for a convincing win wherein second and maybe even third stringers get a chance to play for more game experience. Of course, if it’s not a convincing win, I will take any win. We have a big chance to make Top 2 so let’s go for it. OBF! So how have the teams performed so far? This is just my personal opinion, not scientific at all. Plus I’m Atenean so there will be some bias. Hehehehe. UE – Underachieving. With Roi Sumang and Charles Mammie dominating their positions and enough role players to help them, UE should be a shoo-in for the Final Four, maybe even in the Finals! What happened to them? They have a good coach naman. Their vaunted press gives them many free points. I believe they are just having a hard-luck season. How many games have they lost by only 2 points? Overtime loss. UE starts strong but maybe because of the press they run out of gas in the end. Sayang. What could have been. ADMU – Overachieving. Who would have thought they would lead after the first round and is presently 2nd place in the tourney this late into the season. With numerous rookies and a new system, Ateneo needed to jell quickly. 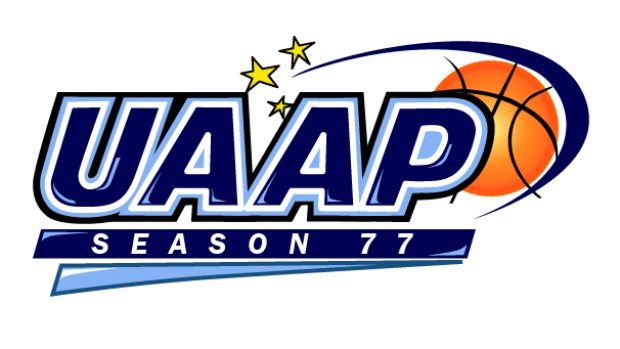 Since ADMU didn’t join any pre-season tourneys, no one really knew how to rank them. It was just safe to say that they would vie for a Final Four ticket. Kiefer Ravena is having an MVP-type of season and Ateneo needs him to perform in their remaining games. NU – Overachieving. After the departure of Bobby Ray Parks, many thought there went the fortunes of NU. But NU is well-coached. Kudos to their coaching staff for defining the role of each player and making them play like a team. Oh yes, it helps to have a player like Aroga. Troy Rosario is the new alpha-male for NU. FEU – Overachieving. Did anyone expect FEU to place second after losing RR garcia and Terrence Romeo? We all know that FEU can now finally share the basketball and Coach Nash Racela is doing a good job mentoring this team. 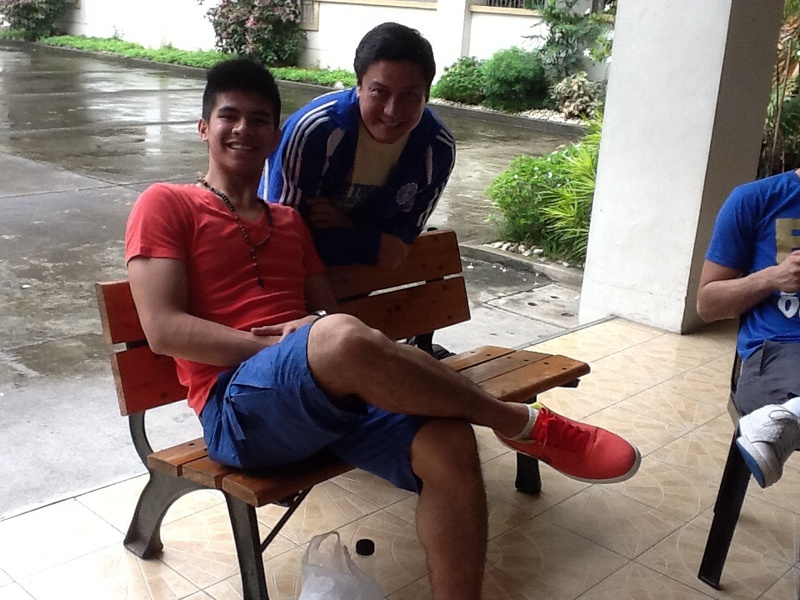 And what can I say about Mac Belo? Simply Amazing! This guy is for real! Good for him. Adamson – Forgettable. Ok they have 11 rookies but scoring a measly 2 points in a quarter is simply horrendous! They now own the dubious record of having the fewest points scored in a quarter in a UAAP tourney EVER! Then they seem to be having coaching problems. This is definitely the longest season for them in recent history. UP – Rollercoaster? I can’t seem to describe their season. UP has won one game so far. Does that make them Overachievers? Ok they will probably win their 2nd game vs Adamson. So should there be another bonfire? Their coach predicted 3 wins. If so, they are underachieving. UP does well up to the third quarter; then when the opponents make a run, UP seems helpless to stop it. I feel if they had one more star player, their fortunes would change. I’m sure many will disagree and say I should have said this or I should’t have said that but I don’t really mind. Give me your counterpoints in the comments section and maybe we can have a lively discussion. I had fun doing this impromptu analysis and I hope you did too. Enjoy the rest of the season! Someone pointed out to me that Ateneo has lost to National University the last three times they met. Is that right? My old memory of NU is that they were the whipping boys of the UAAP. When any UAAP team played NU, it was almost a sure thing the team would end up with the win. Then in 2008 the Sy family bought NU. Everyone knew that, with their deep pockets, the Sy family will definitely use basketball and sports to promote the school and raise enrollment numbers. Eric Altamirano was hired as Coach and Bobby Ray Parks became the Poster Boy of the team. NU’s fortunes changed favorably, albeit slowly. NU started to win games but unfortunately they would also lose games. Sometimes they would lose games with them comfortably ahead in the fourth quarter. Parks went on to grab two MVP honors but despite that and stellar import Emmanuel Mbe who would average 11 rebounds a game, NU would not reach the Finals. So close, yet so far! This season, with the departure of Bobby Ray Parks, not much was expected of NU except probably to make the Final Four. This is the time for the other recruits of NU to excel, and surprisingly they are doing well! They are tall and athletic and can shoot from the outside. Alfred Aroga is a monster inside the paint and can dominate the big men of the other teams. He is averaging more than 9 rebounds a game and is the leader in blocks. If NU had Aroga last season, they would have made the Finals and maybe would have won it all. Kudos to Coach Eric Altamirano and the coaching staff for making the team competitive and cohesive from the get-go. Come to think of it, the coaches of both NU and Ateneo are UP alumni. For Ateneo to win, everyone including Kiefer must step up. The Phenom had a dismal showing in the last Ateneo-NU game with “just” 13 points. Kiefer has vowed to step up and I’m sure he will find a way to redeem himself. 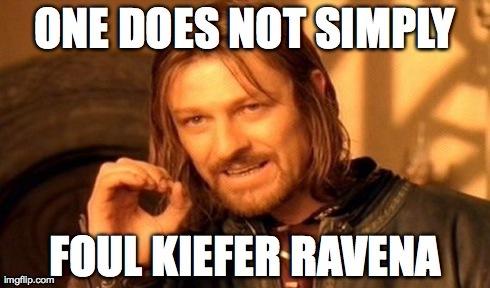 In Kiefer We Trust! When Ateneo played UE, they doubled- and triple-teamed Charles Mammie, shutting him down in the second half. Ateneo must do the same and always put a body or two on Aroga. Will Coach Bo play that card? I expect the game to be a grind it out affair. Both teams will be battle-tested. This game will be like a chess game wherein coaches will try to exploit the weaknesses of the opposing team. As usual, whoever has the poise in the endgame will win. I hope it’s us. It’s Payback time! OBF! To the Ateneo faithful, Kiefer is no flopper. I heard that the NBA is now cracking down on flops. There’s this video in Youtube that gives examples of flops. In fact, Kiefer had been compared to Lebron in terms of flopping. Really? I’ve seen videos of Lebron flop and Kiefer doesn’t even come close to his play-acting! Oh well, at least Kiefer promised to lessen his “foul-selling” antics. Let’s not even touch on the topic of fouls that aren’t called! When Ateneo inbounds the ball, don’t the opponents hold our players resulting in a steal and easy 2 points for them? Or when we are being played too tight and when we try to get away, isn’t our second motion what the referee sees? Let’s not even bring up the fouls that could have been called in the 3-point line when we played DLSU! Sheesh, we also foul a lot and we also get slapped with questionable calls so what is their problem? Do we air our complaints to the media? Do we try to condition the minds of the UAAP Commish, refs and our future opponents of fouls committed against us but never called? That’s where breaks of the game comes in. Now if there is a hidden agenda above all this, that is beyond me. Why are the losing teams picking on Ateneo and Ravena? I think it’s because they are surprised that Ateneo topped the UAAP first round playing small ball! Basketball is supposed to be a “Big Man’s Game” that’s why teams try to get two tall athletic imports and as many Fil-fors that they can. At the beginning of the season, Coach Bo didn’t make any predictions except his hope that Ateneo will pull off a few surprises. If we can win playing small ball, are they alluding that we are cheating? That we get the benefit of the doubt when it comes to iffy calls? I sure hope not because that would be pretty low of them. All these remarks are coming from frustration and should be left unsaid next time. When we lost to NU and DLSU did we complain? We just accept the losses and just move on. That’s maturity. You either realize that your team made some mistakes (and then work on correcting those mistakes) or you give credit to the other team. When we lost to DLSU, Bo didn’t complain about the referees. Instead he lamented on Ateneo’s slow start. And what did we do in the next game? We didn’t allow UE to post a huge lead. Not like Derrick Pumaren. What lesson is he teaching the players? That it’s always someone else’s fault? There will always be complaints about officiating from both sides. All calls eventually average out in the end. So long as there are no blatantly wrong calls, we will accept the outcome. Looking forward to Payback vs NU this Sunday. OBF!